A Tortilla Press is a quick and efficient way to make rotis, puris, chapatis or tortillas. We were recently asked about these presses in one of our Indian cooking classes, so we purchased a couple to see if they were any good. This post lays out the results of our experiment. Why use a press? Well, using a roller pin can start to be stressful on the wrist joints – especially if you have to make loads for some hungry kids! We give our favourite three before digging in further. 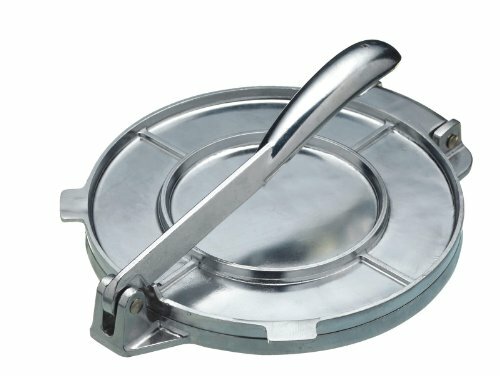 Despite the name, tortilla presses can be used to press chapati and other Indian breads as well. While the three above are our favourites, we explore and give our opinion on five tortilla presses that are available to create that perfect roti, chapati, tortilla or any other flatbread of your choice! Our favourite one is produced by Victoria, which has a very traditional cast ironlook and comes with good reviews from other users. Very much like when we preferred stainless steel spice boxes, other materials are available but they tend to be lighter and not as durable. Which is better – cast iron or aluminium? The first one takes some skill, so we’ll just leave that one as we’ll assume you’re not an old grandmother from a remote village in India! With a roti press, all you do is make the dough as normal and then roll it into balls as normal. You then use a traditional pin roller to roll out the dough balls into thin flat bread, using a rolling motion with your wrists to get the desired shape and thickness. Standard pin rollers can be purchased through your local grocery or supermarket. Once rolled out and thinned, you toss it straight onto a heated skillet and use a kitchen utensil to toss over the chapati every few seconds. Alternatively, if you’re making puris, you can shallow fry them. Instead of using a roller pin to flatten the dough ball, you use a press (pictured to the right). The better ones are made out of cast iron, in our opinion. Firstly, you use the weight of the device to flatten the dough ball into perfectly symmetrical rotis or chapatis. The flatbread is then ready to be placed on a pre-heated griddle. Easy peasy! While the items listed in the table earlier are our favourite three presses, we discuss a further two in total below which can act as an alternative if your budget allows. The reason this wasn’t originally in our top three was because of the price. Coming in at just under £25, we felt this is too expensive for a simple press. However, after feedback and comments from users, we feel that it definitely is worth the money! We do know it’s popular in the USA and it does have a ‘Made in Colombia’ engraving which gives it authenticity. It does look good and has a heavy feel to it. The size is also decent at 8 inches, meaning it’ll do reasonably sized chapatis too. Comes pre-seasoned – ready to use. CONS: Some have complained that the hinge is quite loose and doesn’t tighten as much as it should. Others have complained that it is too heavy to use, but what do you expect for an item that weighs in at 3.04kg! Measuring 6 inches wide, this is small to medium press. If you are wanting to create larger size flatbread, then it’s better to purchase the Mexican Press by Bayless. We would recommend this for people who are beginners when it comes to making flatbread as it’s very light and easy to use. This benefit can also act against the item if you apply too much pressure. CONS: Despite this being a decent and lightweight press, it is a bit on the small side, so be warned. Also, some have complained that bits of the aluminium coating comes off after initial use, so it’s best to check if it’s a defective item before using it. This one is the lighter of the three presses we’ve talked about and it is for this reason, it sits in our top three. 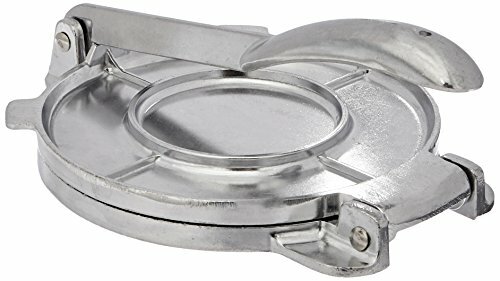 CONS: Some have complained that the base of the press bends if you press too hard, but you have to remember that this is a light item. If you do use a lot of force, it’s better to go for a heaver cast iron press. 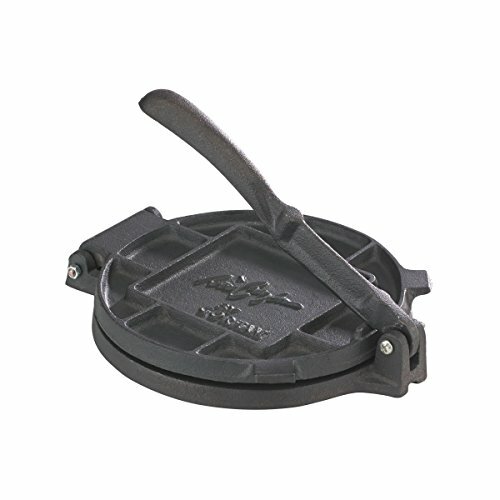 This cast iron tortilla press is a pre-seasoned, medium size press (at just under 8 inches) and comes in a traditional cast iron black colour. This one was our favourite but it tends to be out of stock a lot of the times. As long as you follow the instructions which tell you to rotate the handle as you press it, you should get a decent sized chapati or roti. It comes pre-seasoned meaning it’s ready to use. CONS: The press uses a screw and nut pin, which is easy to assemble in our opinion, but there have been some complaints saying it falls out. Some also say that you need to apply extra pressure, but we believe the rotating action takes a little getting used to. OK, this isn’t the best one available on the market, but it is one of the cheapest ones. So if you’re enot really wanting to make a massive go of it, then this is a good option to uses once in a while. Priced at less than £10, it could also make a nice gift for someone interested in making tortillas or chapatis. It is also a bit on the small side, measuring 6 inches in diameter. CONS: It is shiny, but does feel cheap and… it is cheap! Be careful not to put too much pressure on the handle as it risks bending the base. A lot of the complaints tend to arise due to sizing issues. It’s imperative that your order the chapati press at the right size. For example, the two on the left are at 8 inches and 6.5 inches respectively. Whilst the one at 8 inches is fine for larger chapatis, rotis and parathas, the one on the right at 6.5 inches is more suitable for puris and samosa pastry. Very much like when we were discussing tiffin lunch boxes, an important feature is the handle. 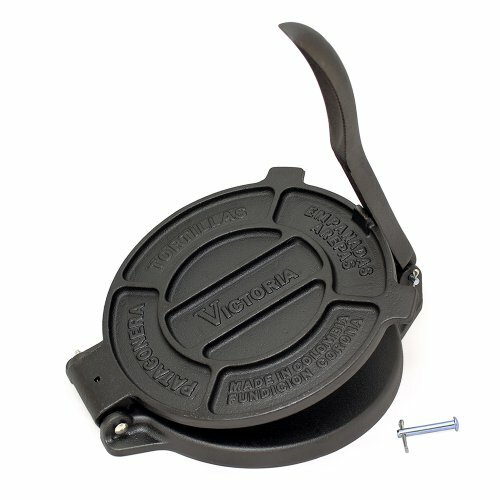 If you are someone who has a heavy and strong grip, then go for a cast iron chapati press. If you’ve got a softer touch and want a lighter item, then opt for an aluminium built one. We’ve just touched on it in the last paragraph, but for us, we much prefer the cast iron tortilla or chapati press. It’s built better, will last a long time and looks the part! Whichever one you choose, let us know by leaving comments or feedback below. The chappatis come out very thick with the chappat press. Have pressed more than 10 times and yet it doesn’t become thin. It is too thick to be cooked properly. Have tried using plastic paper to line the press, oiled the surface of press , put dry atta on the press; nothing helps. The dough is perfectly soft but the press does not make it thin. What is the solution for this?